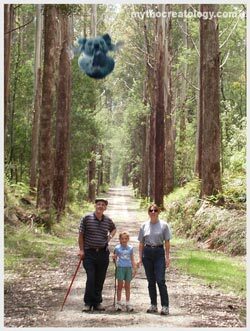 Drop Bears - the terror of the Australian bush. 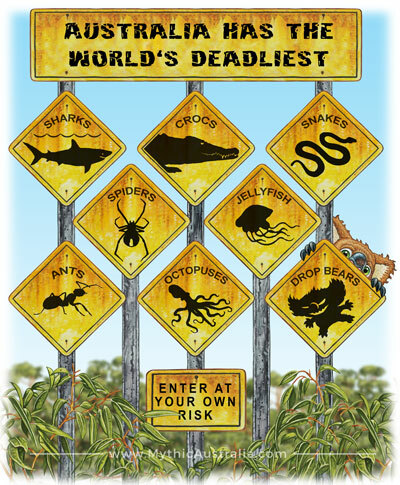 If Australia wasn’t dangerous enough with all the snakes, spiders, sharks and crocs – the last thing you want to be dealing with is drop bears – what a pest. You humans may think you have got it bad with drop bears but think about Pip and I. Try living in the same gumtrees with them. Drop bears are horrible creatures and it’s about time someone wrote a book and warned people about this rotten blighter. Well – wait no longer. 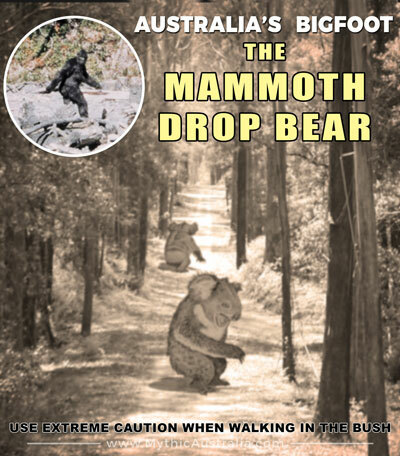 With the help of my good friend, Ian Coate, I have written, “Drop Bear” to give everyone a “heads-up” about this nasty Aussie predator lurking high up in the tall gum trees. If you haven’t heard about Australia’s drop bear, this book is a must read – it may save you the next time you go walking in the bush. 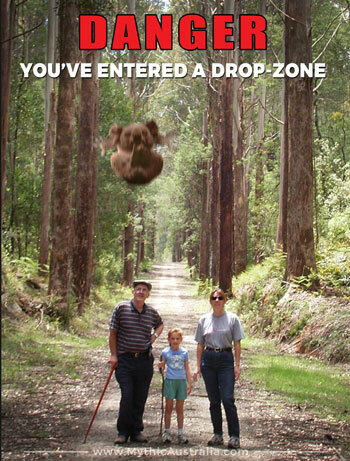 Drop bears have been undetected in the Australian bush for many years. 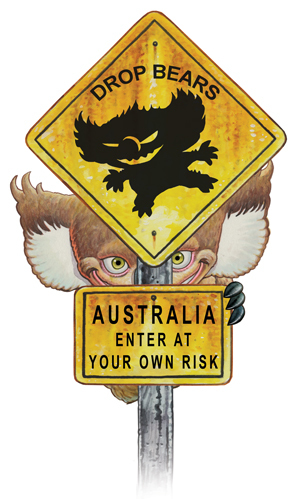 Now more and more people have become aware of this little Aussie predator lurking high up in the tall gum trees. 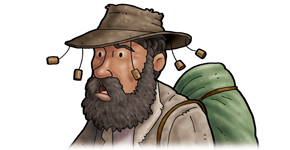 Stories of drop bears are whispered around campfires, Bush guides warn unsuspecting tourists, Rangers put out signs, Aussie soldiers are trained to avoid them and the scouts are always prepared. When walking in the Australian bush, get your eyes off your phones and up into the trees. Drop bears wait in ambush and they love to fall on bushwalkers who aren’t paying attention. Like magpies, drop bears will seldom attack those who are looking in their direction. They prefer the stealth-drops – so look up and live. 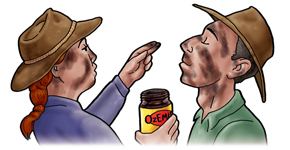 Locals believe a smear of Vegemite or OzEmite on the face repels drop bears. These Aussie products are proven drop bear repellents. Dab it on like sun cream lotion: DB 50+. 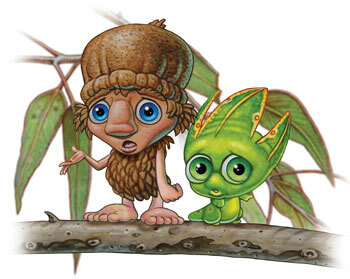 There are no recorded drop bear attacks on people who ventured into the bush with forks in their hair. It seems drop bears target people with strange accents. To reduce risk of attack, speak with a strong Orstralyian accent saying lots of Aussie slang words. Swagmen found stringing corks to their hats not only kept flies away but the drop bears as well. It is believed drop bears react badly to salt. 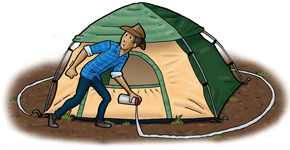 That’s why many campers now make a salt ring around their tents to keep them safe. Unknown to many, drop bears vary greatly in size. The Common Drop Bear (which most people are familiar) can grow up to 1 meter. 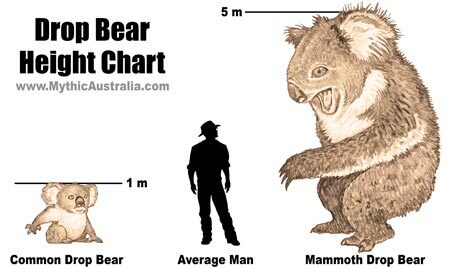 However, the lesser known species, the Mammoth Drop Bear, can grow to a massive five meters. Sightings are rare, but every so often a drop bear is filmed or caught on camera. 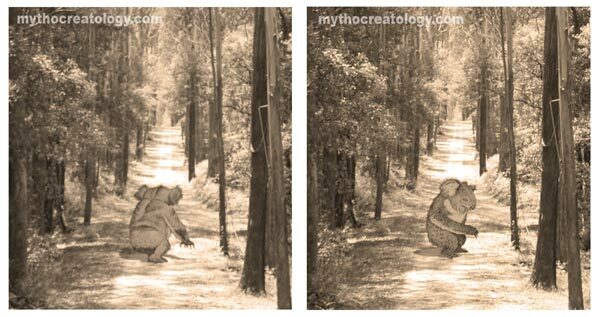 Fortunately for the Mammoth Drop Bears, most think the photos are fakes – much like America’s Bigfoot. 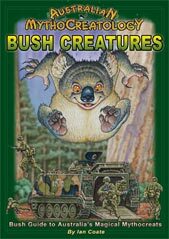 When World War One started and Australia feared it would be invaded, a cunning defence plan was devised involving the Mammoth Drop Bears – they became Australia’s secret weapon, trained to squash invading tanks and vehicles. This training continues today – but that’s a story for another time. Remember to keep your heads up when walking in the Australian bush. Hopefully, this page has done a great public service and will save many people from a drop bear attack. 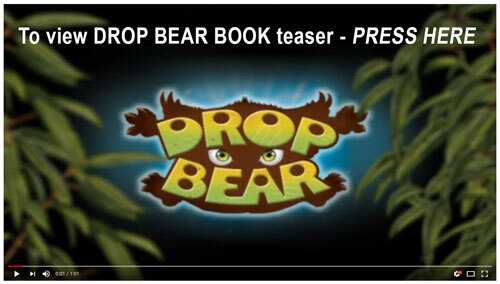 For more information about drop bears, please purchase our fun book – it’s completely safe to read to children and has a surprise ending. The following is old excerpts from the MyhtoCreatology site. 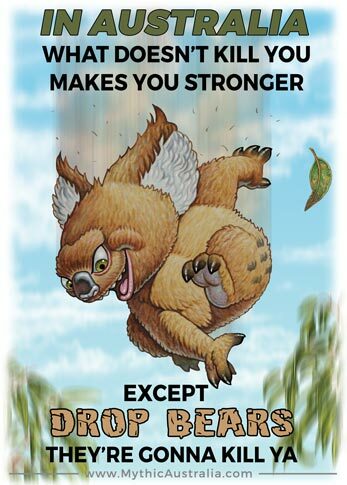 here's a few more facts about Drop Bears. Stories of drop bears are whispered around campfires. 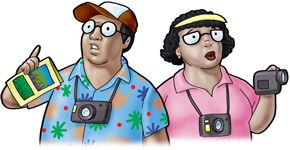 Bush guides warn unsuspecting tourists. Rangers put out signs. 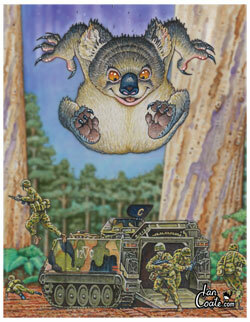 Aussie soldiers are trained to avoid them, and the scouts are always prepared for drop bears. 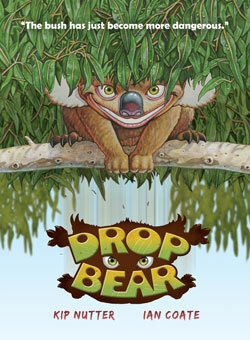 If you haven’t heard about Australia’s drop bear - where have you been? 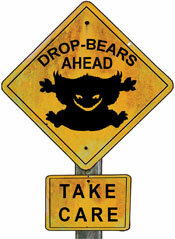 Even though Drop Bears are suppose to be a national secret, it seems everyone knows of their existence. Drop Bears, like their smaller cousins the koalas, are not actually bears - but sadly the bear label has stuck. When they are young, they drop from trees aiming at small targets - like your hat. As they grow in size they drop on larger targets - like your car. They were discovered when the first settlers entered our large forests (or, more correctly put, when Drop Bears discovered the settlers). When the settlers drove their wagons under the huge trees, Drop Bears leaped from the top branches and crushed their wagons. No vehicle could enter our great forests without being turned into a million splinters. 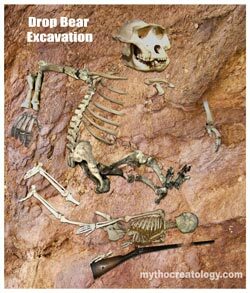 Today, not much is known about the Drop Bear, unless you ask an old soldier, who will tell you all about them. When World War One started and Australia feared it would be invaded, a cunning defence plan was devised involving the Drop Bears. 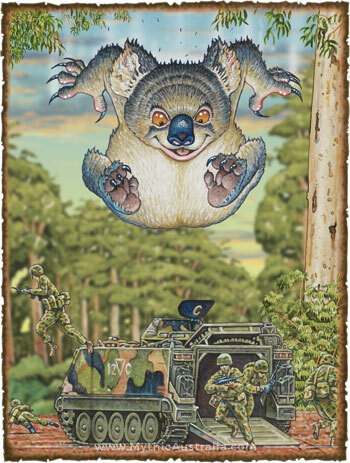 Because no one could get past them, Drop Bears became Australia’s secret weapon, trained to squash invading tanks and vehicles. This training continues today. 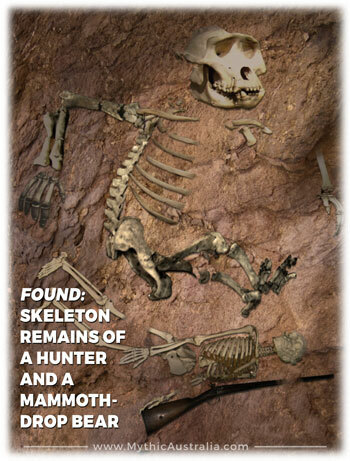 The Mammoth Drop Bears’ location is a military secret. They are trained in undisclosed military bases. However, due to their need for large trees, we can assume these military bases are in Australia’s big forests. Sightings are rare, but every so often a drop bear is filmed or caught on camera and this gives us an insight into their way of life. 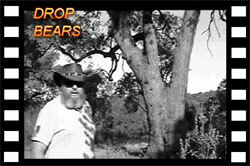 PRESS HERE to view the film footage of renowned MythoCreatologist, Professor Jack A. Roo as he tracks the elusive Drop Bear.